The paths and steps in the Ornamental Gardens in Felixstowe had become worn and cracked. Ronafix Pre-Packed Wearing Screed 25mm+ was used to provide a durable frost resistant topping. Over £3 million of lottery money has been allocated to a refurbishment project at the Felixstowe Seafront Gardens, which date back to Victorian times. 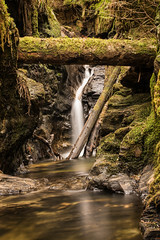 The project includes a Heritage Trail, new planting to enhance bio-diversity, repair of stonework, walls and piers, restoration of ponds and fountains to their original state, refurbishment of the shelters in the garden, new seating and improved signage and lighting. The project also included repair and improvement to the footpath surfaces, edgings and drainage throughout the Gardens. Breheny the main contractor on the refurbishment project asked SIG Construction Accessories if they could supply a suitable product for the path and step repair. SIG approached the Ronacrete Technical team and a site meeting was arranged to assess the situation so that the best product could be selected for the requirements. Ronafix Pre-packed Wearing Screed 25mm+ was recommended because of its durability, high strength and low permeability, making the mortar resistant to frost attack. First the surface was shot blasted, exposing aggregate within the mix to provide a mechanical key. The surface was cleaned and loose materials were removed by vacuum cleaning. The surface was damped before application of Ronacrete Standard Primer. Ronafix Pre-packed Wearing Screed 25mm+ was then applied to the tacky primer to give a hard wearing surface to the paths and steps. Ronafix Pre-packed Wearing Screed 25mm+ reaches a compressive strength greater than 45N/mm² after 28 days; it can be trafficked as early as 24 hours after laying and is frost and water resistant. Ronafix Pre-packed Wearing Screed 25mm+ has played a significant part in restoring the well trodden pathways and steps at the Seafront Gardens. They are now free of trip hazards and strong enough to last many years; allowing future generations to enjoy the splendour of the historic gardens as they follow the paths of their Victorian ancestors. Ronacrete has produced a set of sample cases that contractors can use to display a range of resin bound, resin bonded or tree pit systems to potential clients. Each case contains 24 samples from the RonaDeck range, a RonaDeck brochure, a 4GB USB stick containing product literature and a RonaDeck pen. The cases are available from Ronacrete for £200 + VAT, however upon a contractor successfully installing £5,000 worth of materials (approximately 200-250m2) the contractor will be issued with a credit note for the value of the case with the next order of RonaDeck materials. The cases can be ordered from the Ronacrete sample cases or by phoning 01279 638700 to place the order. 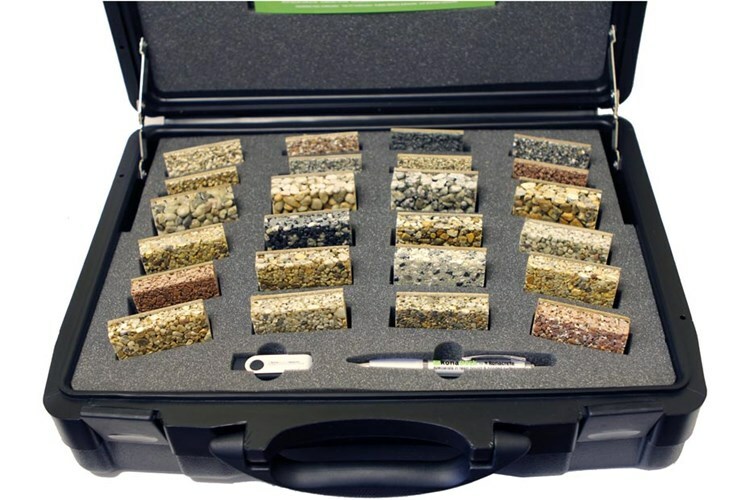 Contractors can select the following samples from the entire RonaDeck range. Manufacturing specialist construction products since 1969, Ronacrete is a recognised industry leader in the resin surfacing market. 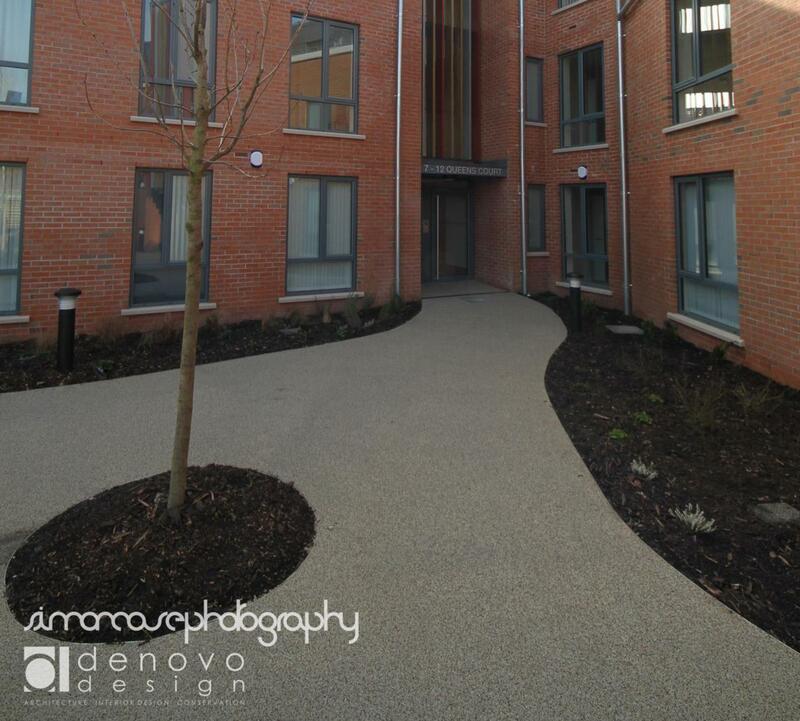 Products include resin bound surfacing, resin bonded surfacing and tree pit systems for users within the domestic, commercial and public sector. 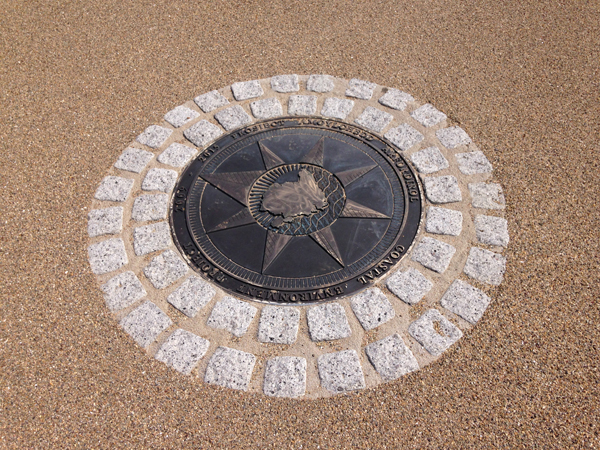 Ronacrete resin based paving systems have been used to enhance the appearance of paths around sporting venues, museums, playgrounds, holiday parks, office blocks, hospitals, schools and colleges as well as privately owned driveways, patios and swimming pool surrounds. Both RonaDeck Resin Bound Surfacing and RonaDeck Eco Tree Pit resins are UV stable and can be laid from a minimum depth of 15mm, shallower than many seemingly cheaper competitors. The permeable paving system created by the resin and aggregate mix is SuDS compliant when laid on a suitable base. Ronacrete has ISO 9001, ISO 14001 and OH SAS 18001 accreditation and is the only manufacturer of resin bound surfacing products that is a member of FeRFA, the resin flooring trade association. Other products in the RonaDeck range include RonaDeck EcoPath MT a permeable paving system that incorporates rubber granules (made from recycled truck tyres) in the aggregate mix, recycled aggregate may also be used in this system. RonaDeck Resin Bonded Surfacing which is a slip resistant, DDA compliant paving system available in a variety of aggregate blends and RonaDeck Eco Tree Pit which is an easily maintainable, SuDS compliant tree pit system which protects the roots of trees from vandalism or other damage, while allowing the tree to receive the water and nutrients required for its health. 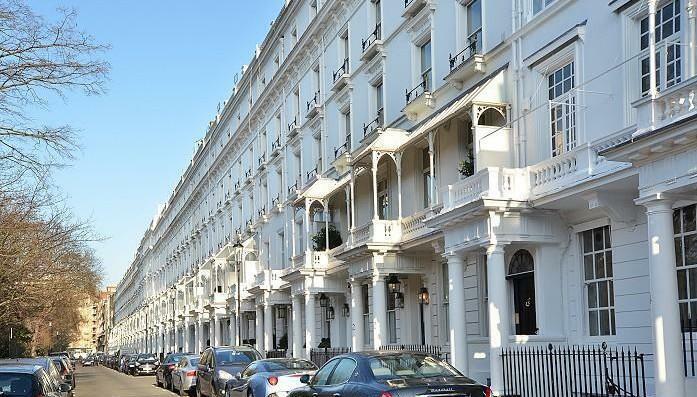 Approved Contractor CCS installed 600m2 of Ronacrete Ronafix screeds to a nine storey £180 million development in Cadogan Place, Knightsbridge. Cadogan Place is described by estate agents as a “prestigious street moments from the many fashionable shops, bars and restaurants of Sloane Street”. 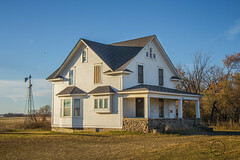 The buildings are chiefly from the Regency period and many have been refurbished to high specifications. As part of a large refurbishment project CCS contractors laid Ronafix polymer modified screeds to several floors of the development. 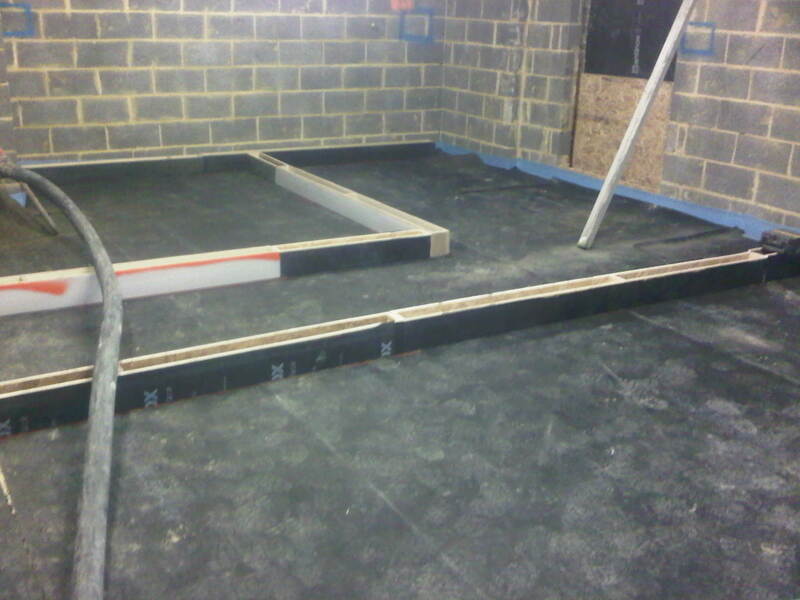 Ronafix Mix A1 and Ronafix Mix G were laid on underfloor heating systems and on acoustic matting. Ronafix Mix A1 (also available as Ronafix Pre-packed Screed 25mm+) and Ronafix Mix G (also available as Ronafix Pre-packed Fine Concrete 25mm+) were mixed and pumped with a Putzmeister M760. Ronafix Mix A1 is a thin bonded or unbonded polymer modified levelling screed which can be laid from any thickness greater than 25mm. The Ronafix Mix G mix incorporates a 10mm pea shingle for added strength. Ronafix Mix A1 is covered by BBA Certificate No. 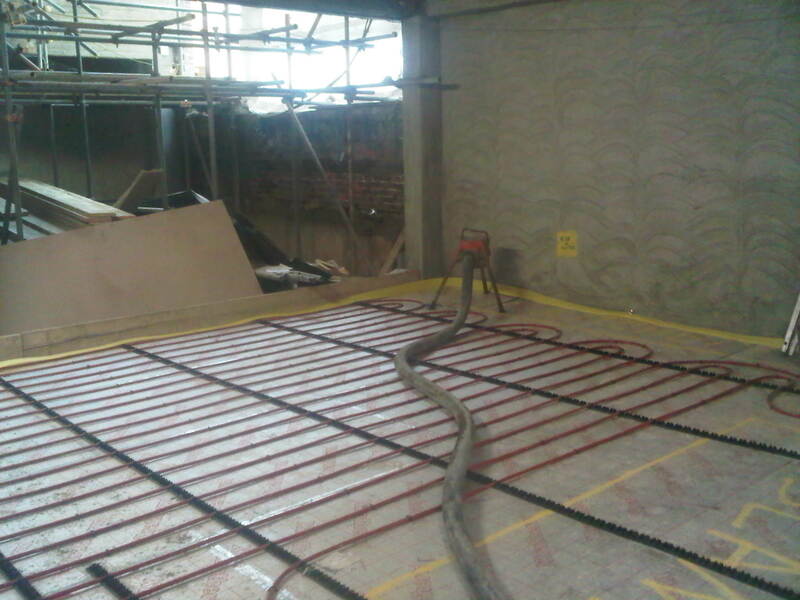 89/2150 providing CCS and the client assurance of quality and performance of the screed in this high value project. All Ronafix mix designs are also available as pre-packed products that offer the greatest possible assurance of screed quality and consistency. All Ronafix screeds provide; high strength, very low shrinkage and low permeability and some, like Ronafix Mix Designs A, B and B1 provide excellent wear resistance. 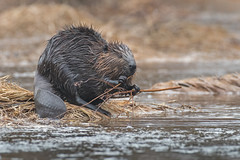 The development at Cemaes Bay is being undertaken as part of the County Council’s £6.9m Development of Anglesey’s Coastal Environment Project (2009 -15) which aims to develop on-shore and off-shore facilities to maximise economic benefits and impacts from the coastline of Anglesey. As part of the Development of Anglesey’s Coastal Environment Project MWT Civil Engineering were contracted to create an ‘access for all beach’. 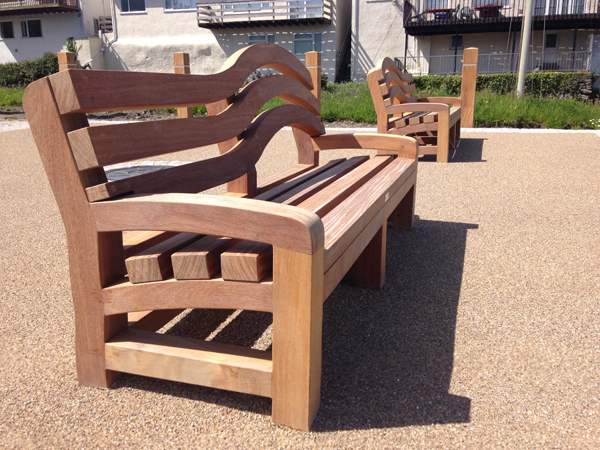 The work involved resurfacing the area, improving access to the beach and installing new street furniture. 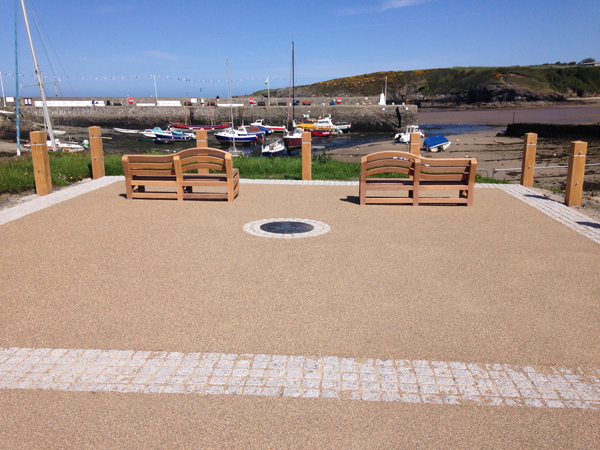 RonaDeck Resin Bonded Surfacing was specified for the resurfaced areas with a 1-3mm Brittany Bronze aggregate. MWT Civil Engineering excavated the area prior to laying the asphalt base on which the resin bonded surfacing was applied. Ronacrete’s RonaDeck Resin Bonded Surfacing is a hardwearing surfacing system composed of a resin base and natural aggregates that offers excellent slip-resistance tested to BS 8204-6:2008+A1:2010 Appendix B. It can withstand heavy footfall year after year and is used in a variety of projects with high visitor numbers, including the ramps at Wembley Stadium. RonaDeck Resin Bonded Surfacing is normally laid on concrete or asphalt as in this project. The asphalt’s surface was open textured so RonaDeck Resin Bonded Scratch Coat was applied by MWT producing a smooth substrate for the surfacing. MWT mixed the two component resin with a drill and paddle mixer and applied it by roller to the substrate. The aggregate was immediately cast into the resin and left to cure for four hours. After removal of loose aggregate, the surfaced area was ready for use. 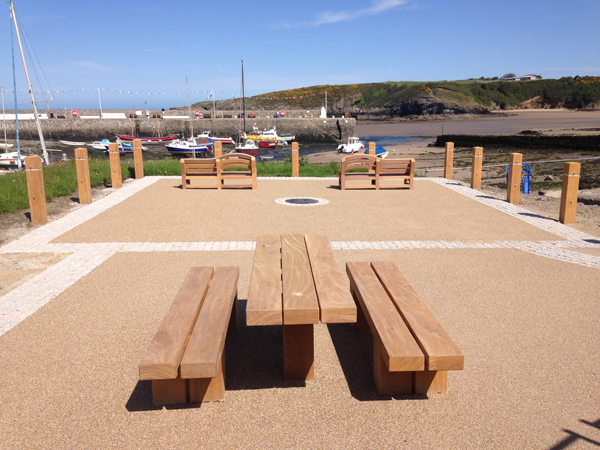 RonaDeck Resin Bonded Surfacing is DDA compliant, a requirement of an ‘access for all beach” providing a level surface that is slip resistant and wheelchair user friendly. RonaDeck Resin Bonded Surfacing is also suitable for vehicle traffic. Selling a comprehensive range of high quality materials, for both new and refurbishment projects. Generating specifications with local authorities, housing associations, contractors, specifiers, and architects. Increasing our network of approved contractors. Carrying out RIBA CPD accredited presentations. The ideal candidate will be based in London or the South of England. The ideal applicant will have an existing knowledge of the market, established relationships with target group, good communication skills and be a highly respected and successful sales person. If you would like to register your interest in this position please click here. 250 square metres of RonaDeck Resin Bound Surfacing was laid to the entrance and gardens of Wigan and Leigh Hospice using Harvest Crunch aggregate blend. 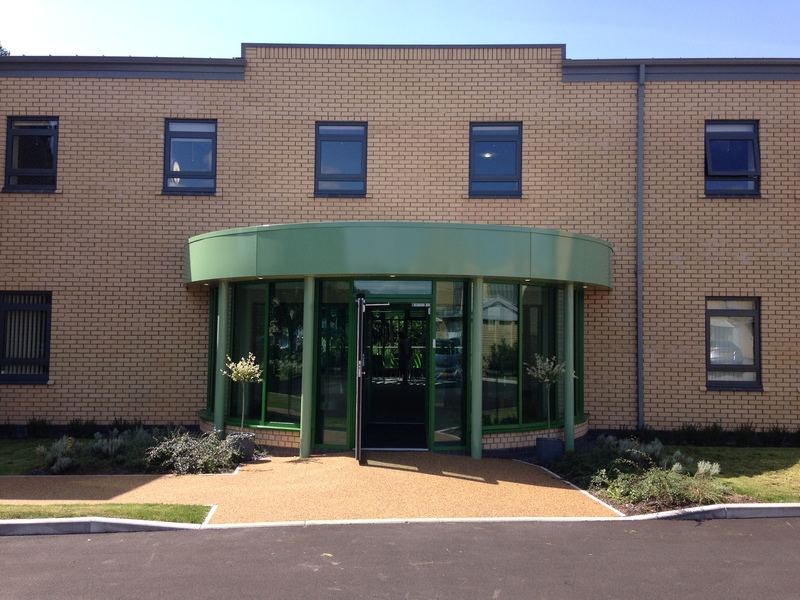 The Woodview Centre was added to the Wigan & Leigh Hospice in a £1.5 million building project which included a two storey building to house the Hospice in Your Home service, consulting rooms and therapy clinics, it also involved landscaping a large area of grounds. Ellenby Construction began work at the site in April 2013. The client’s brief was to “build a modern eco-friendly development within a peaceful and therapeutic environment”. It is known that a green and leafy setting can benefit a person’s wellbeing and the landscaping was designed to provide a tranquil and relaxing outdoor environment that could be viewed and visited by patients and their visiting friends and family. Pathways were installed through the existing woodland area and a new pond was installed, providing a natural link between the new Woodview Centre and the original hospice gardens and nature reserve. Paths and the entrance to the new centre were surfaced with RonaDeck Resin Bound Surfacing, using a Harvest Crunch aggregate blend. 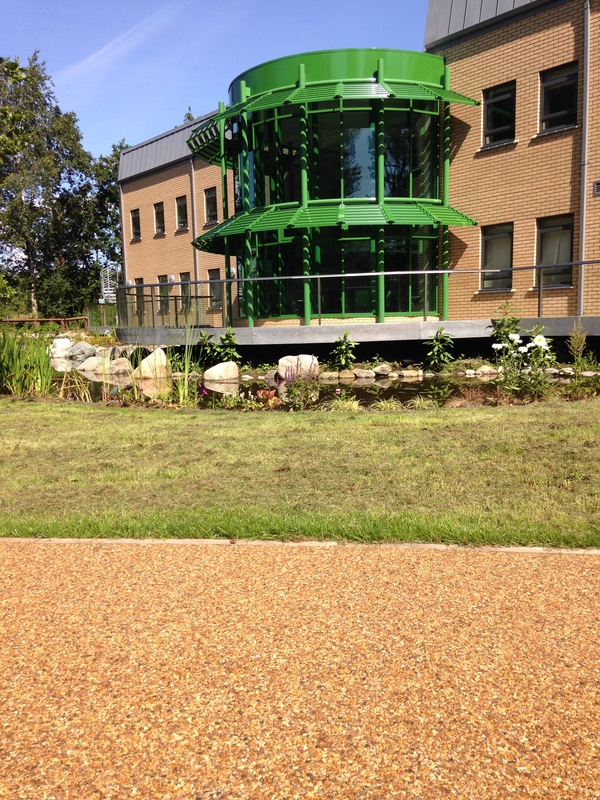 RonaDeck Resin Bound Surfacing provides a slip-resistant surface for patients and carers to be able to enjoy the natural outdoor setting in safety. RonaDeck Resin Bound Surfacing provides a strong, durable and porous pavement, which is particularly suitable for wheelchair ‘traffic’ as wheels will not sink and get caught as they can in loose gravel paths, the porosity of the system allows water to drain to the base and ensures that paths are free from standing water. This permeability makes the surfacing system SuDS compliant, which is in keeping with other sustainable aspects of the building project which include solar panels, under floor heating and the new pond which increases biodiversity in the area and is refreshed with recycled rainwater collected from the centre’s roof. Ronacrete Approved Contractor Elite Surfacing mixed the two resin components with a slow speed drill and paddle before adding the resin to a large forced action mixer containing the aggregate blend. After ensuring that the aggregate was fully coated with resin, Elite Surfacing spread RonaDeck Resin Bound Surfacing to level at a depth of 15mm and smoothed the surface with a steel float. The finished surface was ready for foot traffic within four hours. The project was given a Royal seal of approval in June 2014, when Prince Edward officially opened the Woodview Centre. He was given a guided tour of the site which included a visit to the pond and the new landscaped areas via the resin bound pathways. Ronacrete received this piece of news from architect firm Denovo Design, the architects involved in the design of Queen’s Court, Widnes. Delighted to be able to share our news with you that Queens Court is to be recognised with an International Green Apple Award for Built Environment and Architectural Heritage. 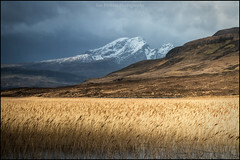 Enter your email address to subscribe to Ronacrete's blog and receive notifications of new posts by email.